2 Hounds Design Freedom No-Pull Harness Training Package has everything you need to help make walking your dog fun and safe! The Freedom No-Pull Harness is made with stainless steel hardware and four adjustment points to ensure that it is strong enough to hold any size dog from 14lbs all the way up to 250+ lbs. To help prevent rubbing and chaffing sores behind your dog's legs, the chest strap is lined with soft Swiss velvet and the straps are turned out to prevent sores and raw spots along the seams. The patented Freedom No Pull Harness features a control loop on the back of the harness. It tightens gently around your dog's chest to discourage pulling and makes walking your dog an easy and a much more enjoyable experience. Imagine have a dog that doesn't pull you down the street! 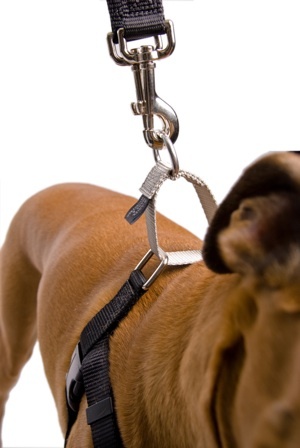 You also have the option of connecting the included training leash to the structural ring on the front of the harness. 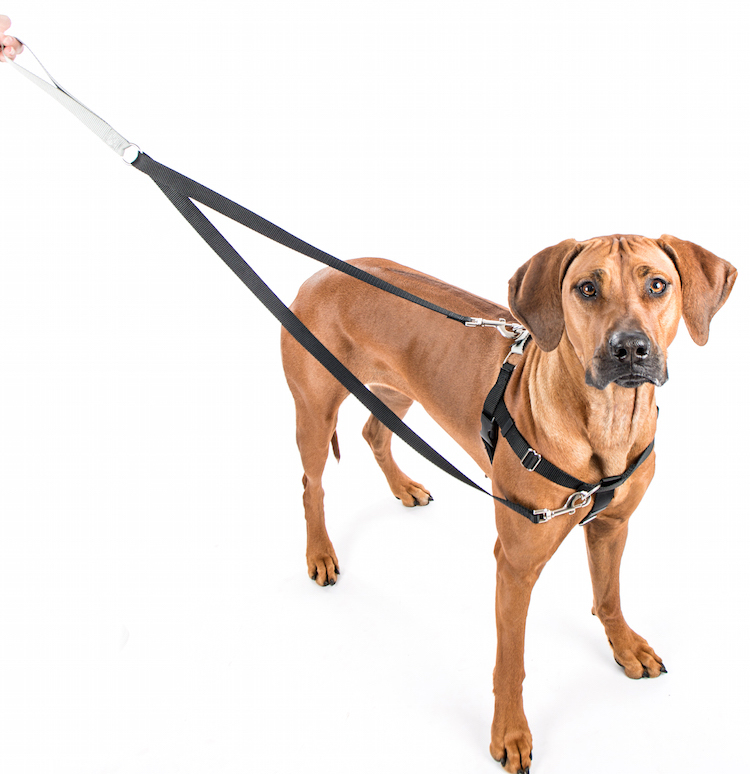 With the leash connected to the front and back of the harness, you will have even more control. 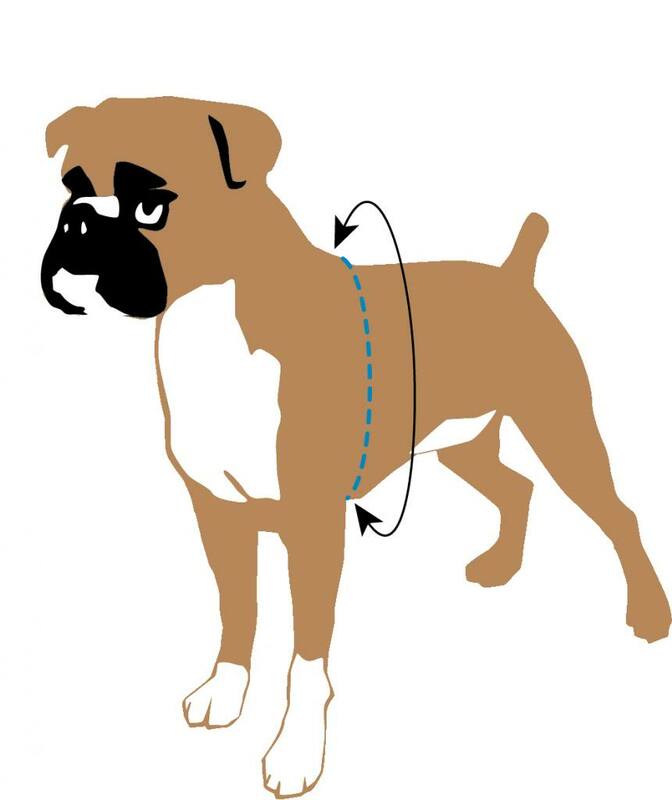 While the main connection on the back of the harness tightens gently around the chest to discourage pulling behavior the connection on the front of the harness allows you to redirect your dog's attention back to you for training and treats. 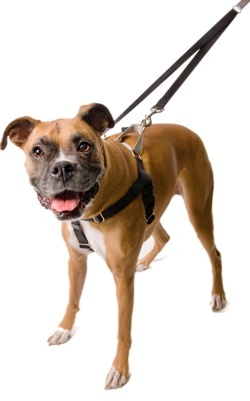 Alternatively, you can use the training leash to connect to the harness and a collar at the same time providing additional control points. Made in the USA by 2 Hounds Design. 1. 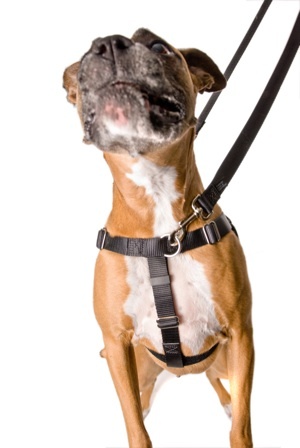 The patented Freedom No-Pull Harness -- the ultimate training tool, featuring a martingale loop on the back of the harness, to tighten slightly around your dog's chest and discourage pulling - and a connection in the front that allows you to redirect attention back to you to make training your dog easy. 2. 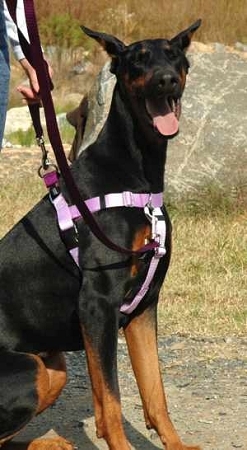 A Coordinating Training Leash which allows you to connect to the front and the back of the harness simultaneously, or connect to the back of the harness and a collar at the same time, providing additional control over your dog. The harness features a contrasting loop (which can be seen in the photos) to make it easier to put on and take off. Sizing information: Use a soft tape measure (tailor's tape measure) or if you don't have one, you can use a piece of string or ribbon. Mark the measurement around the chest and then measure the string from the end. See image for where to measure your dog. After being measured reward your dog with a tasty treat! 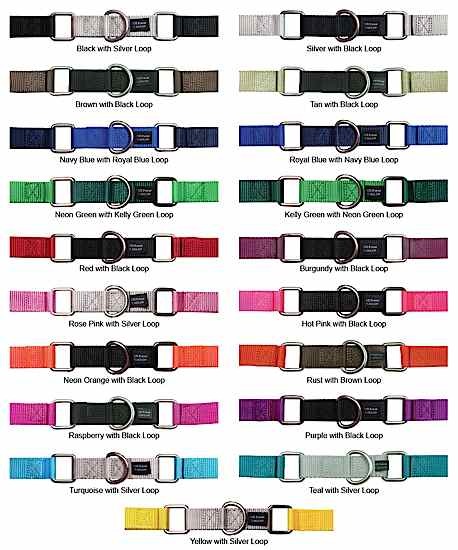 Harnesses come in 5/8" and 1" widths as listed above. 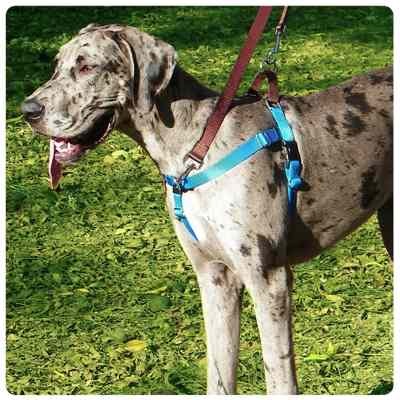 This harness is the best on the market for controlling a strong dog and comfort for animal. I love this harness. Our dog responds very well to it and hasn't tried to gnaw it off like the last harness. It gives me great control when I am walking the dog while pushing a stroller. I know longer feel that he his going to pull us all over. The harness is helpful in reducing pulling. This seems to be mostly due to the ability to place the leash in two locations while reducing the length of each section. However, my thirteen week old Labradoodle was able to quickly chew through the leash that goes under the chest. While he walks he can grab it. Also, I left it on him while he walks through the house and in a few minutes time took one tiny thread and chewed through it (so take the leash off). My husband made a replacement leash with materials from Home Depot (tightly braided round nylon rope and attached clips). The company needs to come up with a more durable rope. My puppy has not chewed through our (other) leash and he has it on all the time in the house. We have found the harness to work really well for our dog! She does not pull any longer. Our children can even walk her if they are right beside us. I really like the velvet-lined portion. The only thing that really bothers me is the clanking of the silver hook where the leash connects to the harness. It is pretty loud! All in all we are happy, though! This has made such a positive difference in the way our Boxer walks on a leash. So glad we tried it! Love this harness. We have tried another harness that has one D-ring at the back but it did not have enough control. My boxer likes to "play" with cats and tries to go after them. The short leash, martindale loop, and the d-ring in front helps me have more control when we need to stop his forward progress. In general, he walks without any pulling, except to cats :-), and the harness is also easier to put on or take off. I purchased this item without the dual leash from a local store for alot more money, and there was not any color selection. When I found Five Barking Dogs that same day, I returned the expensive item and purchased this one in green, the color I wanted, with the double leash included! My Parson Russell Terrier has gotten out of any harness I have bought by backing out of them. So far so good with this one. Just make sure that it fits snug and no more reeling in the lead from the yard with just a dangling harness attached! Love the free shipping! The quality of the harness was above my expectations. I have tried it on my female American Bully and she responds nicely. The gentle tightening around her chest seems to be the key to stop pulling. Great product. We love this harness for our pup! It has made a huge difference in how well our walks go as well as obedience classes. I would highly recommend this product to any dog owner. I am so pleased with this freedom harness, it has made walking with my rather headstrong whippet so much more enjoyable. It was a pleasure doing business with Five Barking Dogs. Harness is easy to put on and take off dog. I love the idea that this harness offers better control of a "puller." (and my Dane IS a puller!) It works! The color is striking as well. (I bought the turquoise one). I also bought the double leash; it's concept is good, but after years of using a "regular ol' leash," I have to get used to using this one. So far, so good! This has been a great harness for the dog we got out of the shelter. He is very interested in anything going on while we are walking so it was a constant battle to tug him along. This harness is perfect to teach him to heal. The only down side is the leash part isn't long enough for him to go off road to go the bathroom. But overall it has been a blessing. This is an excellent harness for walking or for securing in the car. Recommended by our Trainer. Fits well (our dog walked out of other harnesses) and keeps her neck safe when we are walking. Highly recommend this product. Good Product. Well made. Our dog is a puggle and training with a color has been difficult as she chokes. Freedom harness has made training much easier. Love this harness! I have a pit mix and this is perfect for her. I love the velvet lining and the double hooks it comes with. 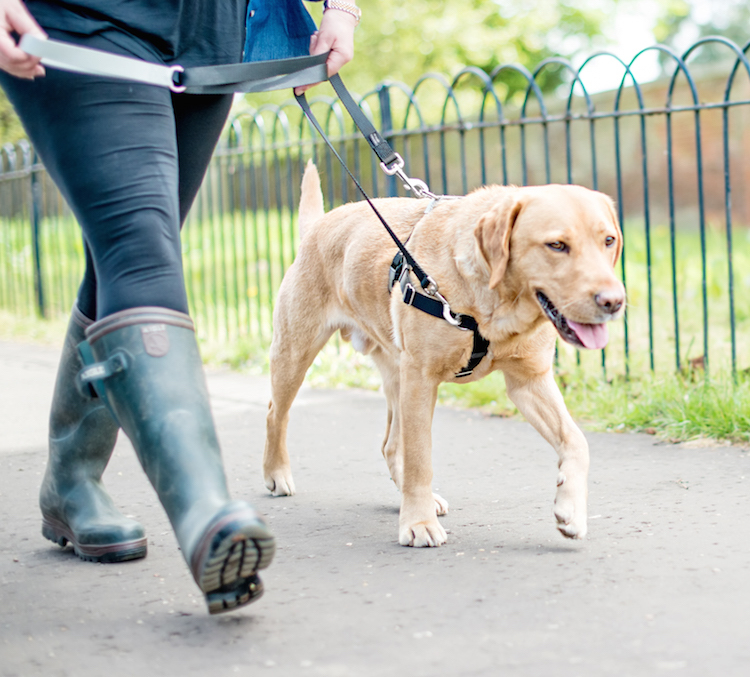 Positive Training>Dog Walking Made Easy!